Lodge Zetland No 391 held a Whisky Tasting evening within their premises on Friday 3rd October. On the evening the Brethren present were treated to some very unique whiskies ranging from 14 years to 32 years old under the expert guidance of Mr Alex Bruce(KQ). 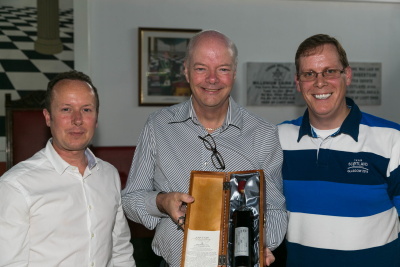 The proceeds raised on the night amounted to a staggering £530 which will be gifted to Prostate Scotland in conjunction with the Charity Cycling Committee’s fundraising efforts. Incidentally the raffle prize was truly a "money can't buy prize" - a signed 31 year old Speyside Distillery Directors Edition, one of only thirty-one bottles in existence. Previously a bottle was purchased for 1200 Euros by none other than Prince Albert of Monaco.